Remember, appropriate care and cleaning will protect the investment you’ve made in your home. And don’t forget to use our stain removal guide for life’s little accidents. Your floor will give you so much satisfaction in the years to come, but only if you keep it in great shape. Here are a few tips – common-sense precautions that will make your relationship with any flooring a long and happy one. For increased crush and dent resistance, support furniture with wide-bearing, non-staining floor protectors or wide-bearing leg bases/rollers. As a general rule of thumb, the heavier the item, the wider the floor protector should be. Protectors should be at least one inch in diameter, made of non-pigmented, hard plastic and rest flat on the floor. Non-staining felt protectors are acceptable. Barrel-type casters with a minimum 3/4″ flat surface width or flat glides are best for moveable furniture. If you choose to use metal protectors, make sure they are rustproof. Replace your narrow-dome furniture rests with wide-bearing ones. Routine care and maintenance are essential to maximizing the beauty and life of your flooring. Over time, normal foot traffic and soiling will cause a change in the flooring’s appearance. For hard surfaces, vacuum (without a beater-bar), dust mop or sweep the floor on a daily or weekly basis to minimize abrasive grit and dirt. 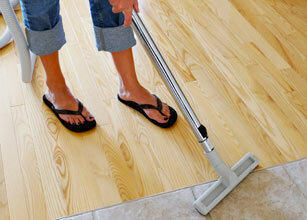 In very sandy areas or at the beach, you may want to vacuum or sweep more frequently. When using a liquid cleaner, be sure to dry it or rinse it thoroughly to avoid a film. Read and follow the manufacturer’s directions for care, cleaning and recommended products. Caution: Hard surface floors can be slippery when wet. Use extreme caution when walking on a wet floor.